The “reform” will begin with a review of proposed parking regs at the Jan. 4, 2018 meeting of the Los Altos Planning Commission. Later this year, after dealing with parking reform, Lalahpolitico expects that regulations about downtown building height, setbacks, lot coverage, floor area ratios, parapets…etc. and about allowable uses ….yoga studios, ground floor office…will be tackled by the Planning Commission and eventually brought to City Council. Lalah looks at two different items below – the parking committee report vs. the downtown visioning economist report of mid- December. 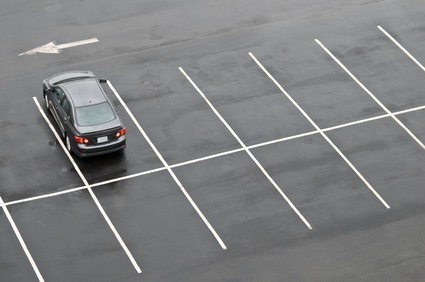 The Parking committee report is online on the city website. 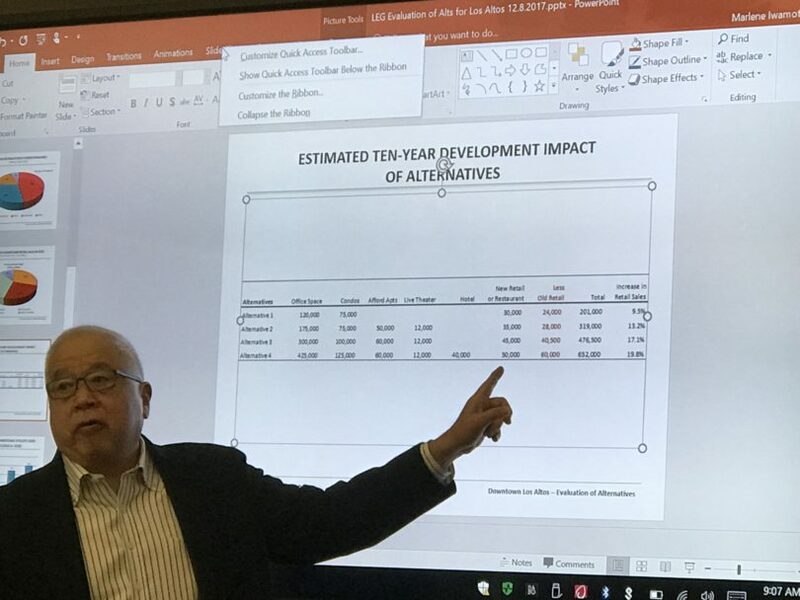 The economist’s newest analysis was presented in Powerpoint to a “downtowners” meeting in December, but is not on the City web site to my knowledge. So on Jan. 4 the Planning Commission will begin to review the now 3 or 4 year old Parking Committee reports at its Jan. 4, 2018 meeting. Here are some highlights of what parking reform is proposed by that Parking Committee: Packet here. Establishment of a “standing” [aka permanent] Parking Committee [Commission?] Lalah: let’s keep eyes on this! Quick Recap: Some people feel Mr. Packard and “his” council pushed thru several project developments downtown – including the hotel, Packard Foundation, Safeway, 400 Main – even though those projects were officially “underparked, ” pushing them through via discretionary “findings” of mitigating benefits. Yet Sorensen’s building was blocked, even when he offered in 2012 to reconfigure Plaza 10 with narrower stalls — at his cost –to add the ~20 parking stalls that his project was officially missing according to parking ratio “law.” Original Downtown Parking District owners on Main and State say that the Packard Council changes to downtown reduced their parking supply by around ~100 stalls. They are not forgiving. The 2012 Parking Committee was comprised almost entirely of people who have commercial real estate interests. Update Jan. 5, 2018. The PC was comprised almost entirely heavily of persons with Los Altos commercial property interests or interests in real estate development and/or real estate transactions and /or “merchant” tenancy. There was an architect involved and a leasing agent. Exceptions are 1) Gary Hedden, an environmentalist working to reduce use of fossil fuels in transporation and housing and 2) Mark Rogge, an engineer 3) Mike Mc Tighe, 4) Lou Becker, retired engineer. Several other persons with interests in the local commercial property market — but not appointed to the PC — for example, the Sorensens, were encouraged to contribute to the various subcommittees. And Mr. Packard – ex mayor – was looking for transparency too. After about a year, when the Parking Committee Report was being finalized, Packard “blew the whistle” on the Parking Committee by pointing out violations of the Brown Act. Council member Jean Mordo – who was the key City Council liaison on the committee — apparently “allowed” subcommittee members to exchange information non-publicly in ways forbidden by the Brown Act. Even if unintentional, it’s still a violation. This “tainted” Mr. Mordo, all the committee members, and the findings of the committee. It halted the then imminent presentation of the report to the Planning Commission and Council…lo for these 2-3 subsequent years. [Jean Mordo has said recently he has no animosity toward Ron Packard.] Lalahpolitico saw the parking report back then and now; very little is substantively different. Some prior posts about the feud..
A good thing to come out of the delay caused by the Brown Act investigation of the Parking Committee Report is that the City had to hire a consultant – Mr. Walker – to a least do a sanity check on the ~400 page report package. Lalah recommends the Walker Memo as a quick over view of the 400 page packet of documents. See this excerpt. 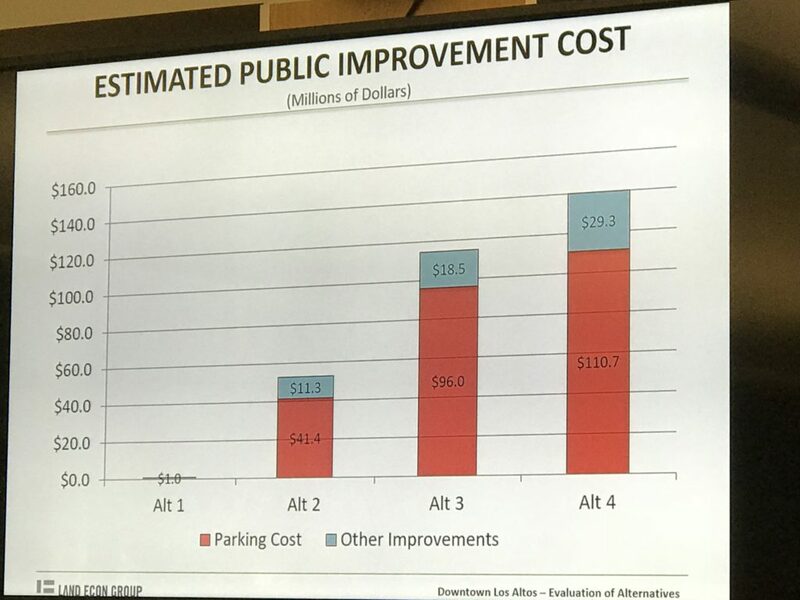 Based on the documents [we] reviewed, we identified the central parking issues to be a shortage of parking spaces and a lack of parking revenue to fund the improvement, maintenance, management, and operation of the parking system. Upon reviewing the Committee’s work we have preliminarily concluded that the report may not sufficiently encompass all elements needed to address the problems of the parking system as a whole. It is our preliminary conclusion that the solutions presented do not result in a comprehensive parking solution, but rather on an issue-by-issue basis, which may be less effective. AECOM consultant could get only eightly 8.5 feet wide stalls on plaza 10. So they decided to use this Sorensen plan which produced 105 stalls. This is the “offer” to provide parking that Sorensen hoped would get their 40 Main project approved back in 2012. Before the outside consultant Mr. Walker was on the scene, the City had previously hired AECOM in 2012 to study plaza reconfiguration, perhaps as part of the ad hoc Parking Committee effort? 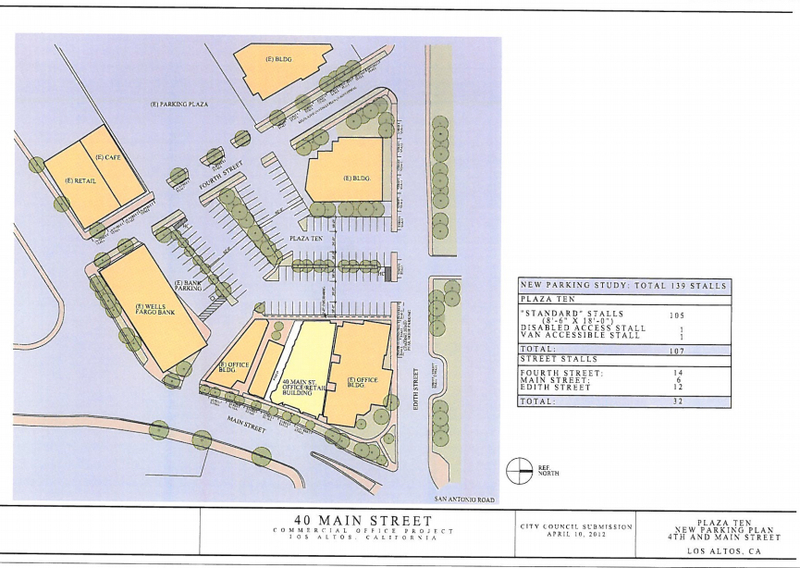 It is interesting that for Plaza 10 – AECOM chose to use the Sorensen offer/plan to reconfigure the plaza. The Sorensens came up with over 20 more extra stalls than AECOM could design on Plaza 10. Lalahpolitico: is this surprising or irregular? Maybe. Or did AECOM just bow to superior intellect? AECOM came up with 80 total stalls, while Sorensen came up 105. I have not seen it, but I understand that the Sorensens’ most recent 2017 layout plan for Plaza 1o includes some circulation improvements on the ingress/egress from Eidth. It can get quite congested there. The 2012 AECOM report found that over 130 spaces could be added to the downtown plazas by repainting them as 8.5ft. wide. 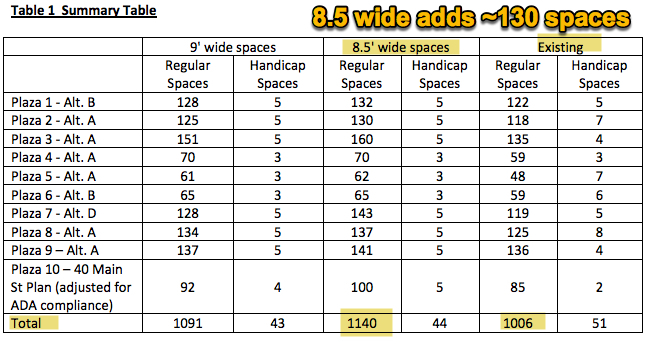 And the plaza restripping and stall size reduction research apparently was generated by a City paid consultant study from AECOM of San Jose. . Recently I’ve heard some downtown owners and our RNN downtown visioning consultant say that if all the downtown plazas were restripped, that would remove the parking stall deficit. Maybe no parking structures would be needed as described in the Alternative Scenarios!. This is the infamous 100+ stalls deficit being blamed on Packard-Casas-Carpenter Council who approved the 2012-2013 downtown “street beautifications” and several new downtown developments with less than required parking. Whose Money for Downtown/City-wide place-making? Sales Tax and Hotel TOT taxes contribute about 15% of annual city revenue. 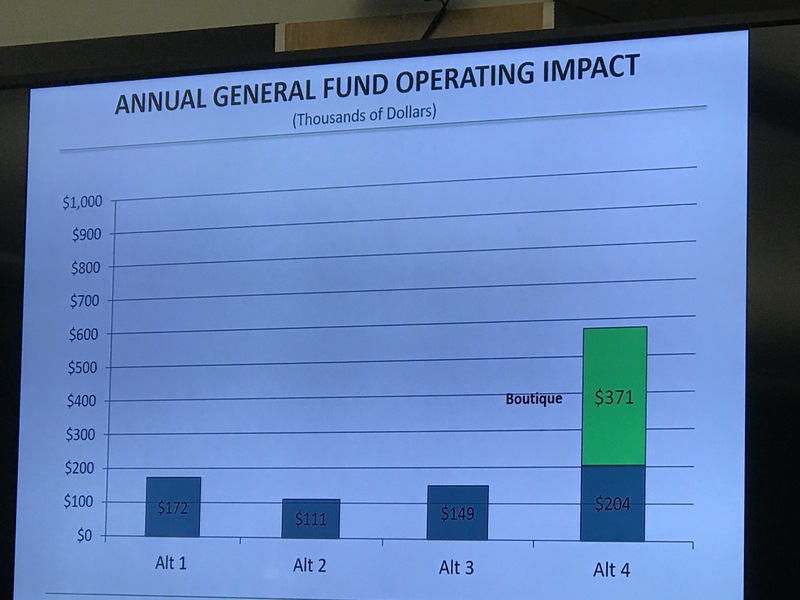 The new downtown Los Altos hotel contributes ~$300,000 so the bulk of TOT revenue comes from the two hotels on El Camino. 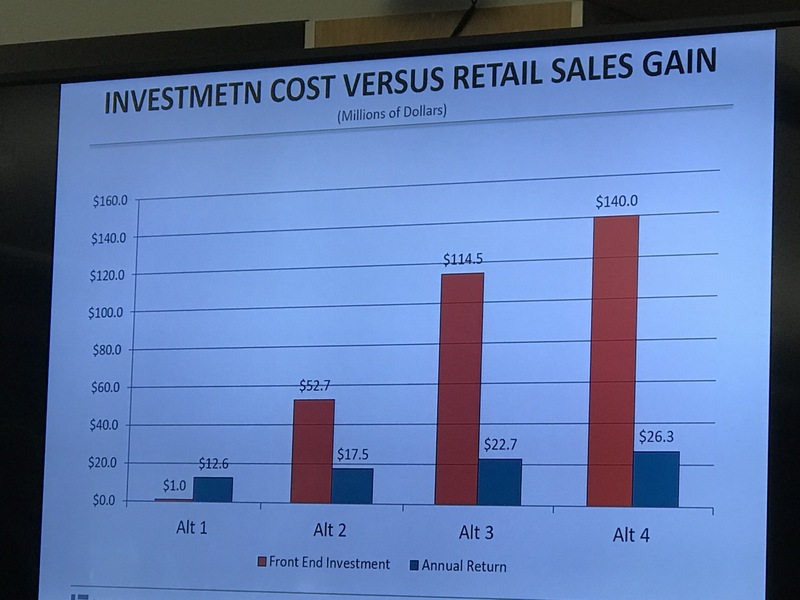 City sales Tax includes retail on El Camino (like Whole Foods), Loyola Corners, Rancho, Lucky Foothill, Trader Joes plaza at Homestead. Sales Tax and Hotel TOT taxes contribute about 15% of annual city revenue. The downtown hotel contributes ~300,000 so the bulk of TOT comes from the two hotels on El Camino. City Sales Tax sources includes retail on El Camino ( like Whole Foods), Loyola Corners, Rancho, Lucky Foothill, Trader Joes plaza at Homestead. The share of sales tax arising from downtown is just a fraction. 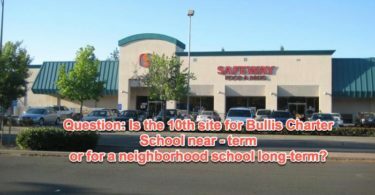 The vast bulk of the commercial/retail property parcels in Los Altos have “been in the family” since Prop 13 passed in the 1970’s, and thus those owners are paying low, low property taxes. Notable exceptions are newcomers like Los Altos Community Investments[LACI] and some others. 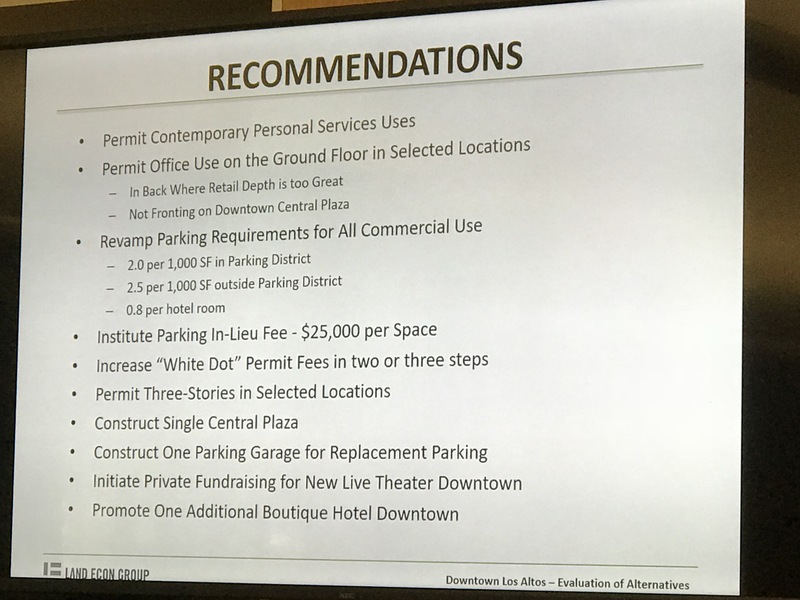 Almost without exception, Lalahpolitico has never heard a downtown owner or merchant say they want to pay for anything specific to their wants downtown — except maybe additive parking stalls. After all they do pay some property tax and sales tax. In practice, they have never paid for downtown signage [ over $600,000 worth city wide], routine repaving plazas, streetscaping on Main and State, the “green” fence along San Antonio, new streetlights on Main and State, the flower pots on Main and State, etc., etc. Of course, they didn’t initiate this fluffy stuff, or did they? 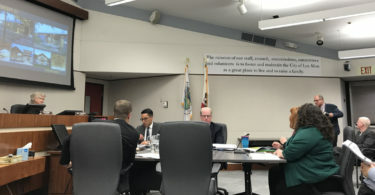 There are a number of business “club”s for Los Altos and for downtown in particular, the Chamber of Commerce, Los Altos Village Association (LAVA)…What they do provide is a bit of cash to the City and volunteer time for the operational costs of our 2 or 3 beloved parades downtown each year. Very nice, but whooppie!?!? The floats are stored by the City on city land without rent. What else have the merchant/owners done for “community benefit” downtown? They provided the flower annuals for a couple of years and later shifted the entire cost to the City. And now, with the City ceramic planters full of succulents everywhere, the annuals look silly in contrast. 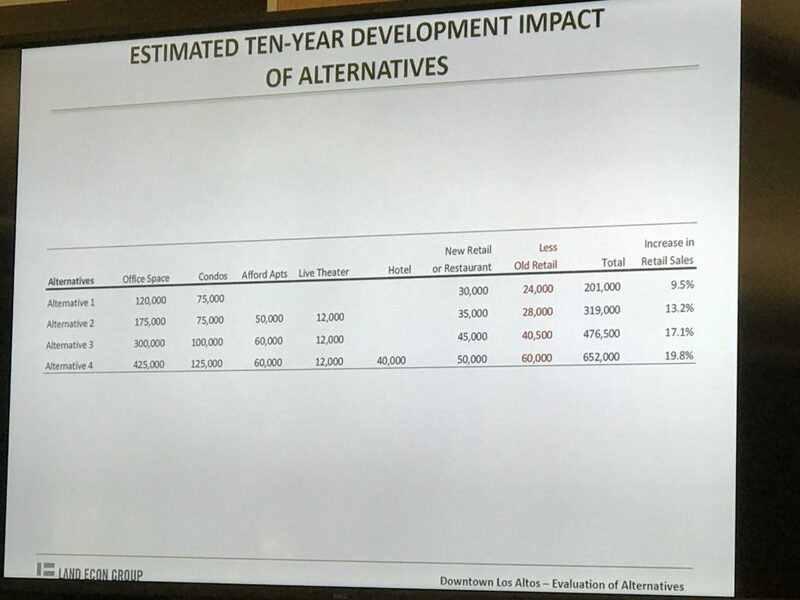 In December 2017, Mr. Lee – a consulting member of the RNN team – delivered the bombshell that all of the Scenario Alternatives, don’t come close to generating enough “vibrancy” as measured in increased sales taxes… to pay for the PUBLIC INVESTMENT in place-making, parking structures, theatre, or low-income housing. Lalahpolitico: What a bummer. The fantasy is killed. Here are some of the most salient slides, delivering the bad news. This is what the PUBLIC, aka the city tax payers would pay out of the general fund to deliver the placemaking, etc., as described the the 4 scenarios…Lalahpolitico: Parking in RED is CRAZY large, especially relative to the size of eye-candy place-making goodies in BLUE. The Downtown owners need to form an assessment district or other way to pay for parking. Do not try to impose this on city taxpayers at large. You can see the the return in BLUE [ extra sales tax ] from the City investment in placemaking and parking RELATIVE to the INVESTMENT in RED just gets worse and worse… as the scenarios get more ambitious. The above slide is the BOMB SHELL. The more the City spends to enhance downtown, the less the return to the investment. Lalahpolitico: That means it isn’t going to happen. All this placemaking is a fantasy. In fact, if the city attempted to pay for this, it would negatively impact the general fund per economist Mr. Lee. Economist Lee suggested the City NOT invest in most of the items. An 70 room boutique hotel – a public private partnership on Plaza 1 — is the only thing that really provides a lot of revenue…which could be channeled toward paying towards eye-candy goodies like a Central Park on plaza 5, shared streets, etc..
Lee’s recommendations seem reasonable. Except he does not instruct downtown owners to pay for the PARKING GARAGE themselves. BTW, the 8.5ft wide Plaza restripping plan was apparently excluded from the RNN visioning consideration. They admit if it were included, the parking garage would not be necessary. So there you go. You know what’s gonna happen now–restripping! A 70 room”boutique” – aka expensive – hotel downtown could throw off $1M a year in hotel tax. That is the one thing Economist Lee thinks could be done first. Then that would start increasing a City fund that could be spent on fun things like the Central Parklette and the shared complete streets on 2nd and 3rd streets. Lalahpolitico: Are the downtown residential neighbors ready for more “transients” even if they are well-heeled? The travelers would give a boost to the expensive dining destinations downtown? Wouldn’t they? And what about Homes Near Downtown? Single-family home residents near downtown worry that the proposed new downtown parking ratios will be too low. They worry about the proposed much higher fee for the employee white dot parking permits. They fear these changes will cause cars driven by downtown shoppers and by employees to routinely park on their residential streets. So many residents around these streets — Mt. Hamilton, University Ave., on Pepper-Hawthorne-Hillview, Cuesta — are justifiably concerned. Will more downtown shoppers and employees create congestion on their streets that will leaving no curb parking for visiting friends car and repairmen’s trucks? Possibly. Probably? What to do? 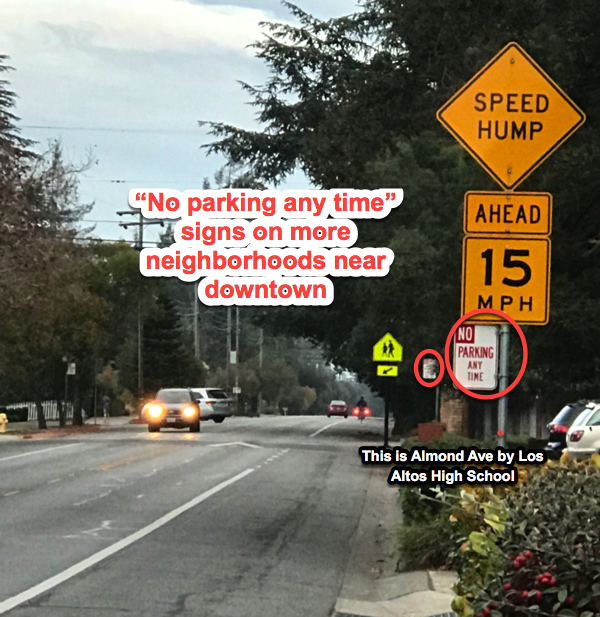 Gird for City spending on “Resident Parking Only” signs like over by Los Altos High on Almond, Gordon, etc….or for spending on a dashboard decal system [Lalah saw this in Pasadena]…and for spending on police enforcment of this. When non-residential uses don’t provide enough parking, your neighborhood might need to live with a no-parking anytime regime, or a resident placard regime. Both raise enforcement costs for the City. FOLA.org recently wrote sagely about Downtown Visioning. Here is an excerpt just about parking. What we should not want is the solution that Mountain View and Palo Alto have taken-residential streets surrounding the downtown areas of both Mountain View and Palo Alto have effectively become the overflow parking. Not only does that lower the quality of life for residents, it changes the character of those residential streets to something much more commercial along with an associated rise in crime. So much for rural Los Altos. Any downtown visioning process needs to recognize that immediately adjacent to the downtown are high end residences which cannot and should not bear the burden of increased commercial activity in the downtown. And the City will pay for that restripping. Why? Here’s why. Downtown owners/merchants believe the City – under the Packard council control – took away over 100 stalls –actual/potential. So to them, it is fair that the City fully pay the bill to restripe all downtown parking plazas to be 8.5 feet, and maybe even pay for Plaza 10? 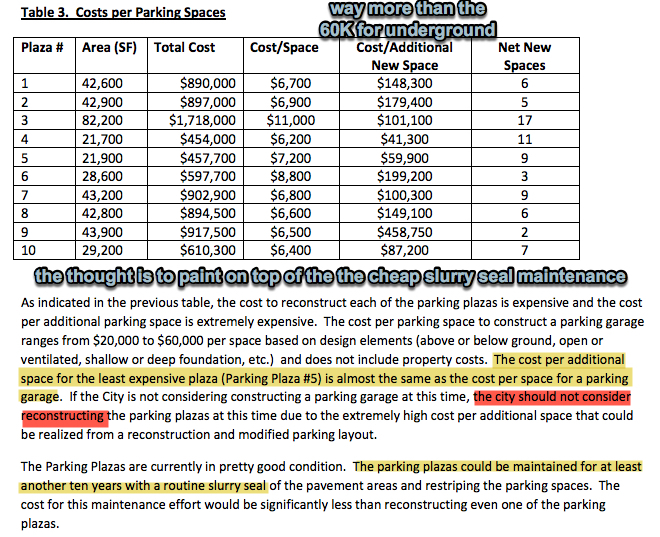 Perhaps the City will just assess the Sorensen 40 Main Street project for 20% of the cost of the repainting of Plaza 10 ? When four years ago, Sorensen’s would have paid for 100% of it!